When Juliet posed the question, “What's in a name?” to Romeo, she didn’t have gardening in mind, but it’s an appropriate question to ask as we hear plants referred to with such terms as bird-friendly, native, alien, invasive, and so on. While many plants are pleasing to human eyes, not all plants are equally useful for the survival of birds and other organisms. Audubon has joined the rising chorus of voices encouraging the use of native plants in our home gardens and landscaping that support wildlife and particularly birds. A “bird-friendly” plant is one that provides food, either directly in the form of seeds, fruit, and other plant parts or indirectly by attracting insects that birds eat; shelter from predators, weather, and other dangers; and structure for nesting such as on the forks of limbs and in holes. Food is essential in this equation. 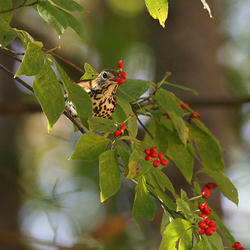 Research has shown that native plants usually are better bird-friendly choices than plants that didn’t originate here. A quick search on the Internet can provide many references to support this statement. Douglas W. Tallamy, a University of Delaware professor, provides a succinct and very readable summary with much background information and tips in his book, Bringing Nature Home: How You Can Sustain Wildlife with Native Plants, Timber Press, 2007. Many organizations and individuals are promoting the use of native plants that benefit wildlife, and along with this growing enthusiasm is the use of several terms that sometimes mean the same thing and in other cases are defined somewhat differently by different people. The term “native plant” seems rather straight-forward. One way to look at the question is to include the concept that they were already here when humans began to notice them. Consequently, a plant that was brought here from Asia, either purposely or accidentally, wouldn’t be considered native. Dr. Tallamy suggests that “here” means where the plant was shaped into its current form by local conditions such as sunlight and soil nutrients as well as interactions with other surrounding organisms. In this sense, native means being fully a part of the ecosystem. People refer to plants that aren’t from here with several different terms such as alien, exotic, and non-native that tend to have slightly different but overlapping definitions. Those terms really aren’t so important, it seems. Dr. Tallamy and others point out that plants that aren’t from here occupy the space and use local resources such as sun, water, and nutrients to grow but don’t return most of those resources to the environment in the form of food for the local birds and other organisms. Another way of saying this is that local plants provide much more of what birds and other organisms need, and this is supported by research. Using local plants in our gardens and landscaping is good for our whole environment, including us humans. When: Monday, Nov. 16, 10 a.m. to 3 p.m.
Help birds survive in a changing climate by attending a special workshop presented in Greensboro on Monday, Nov. 16. Audubon scientists are predicting that half of our bird species will be threatened as our climate changes. Join us to learn more about what you can do to help protect the birds and to take concrete steps to that can make a difference. The program is called Audubon Ambassadors, and you will learn how to spread the message about climate change's impact on birds, how to advocate for change, and how to be part of the solution. The Ambassadors program is Audubon North Carolina’s answer to the Birds and Climate Change Report, a National Audubon study that tells us that 170 bird species in North Carolina could have nowhere to live within our children’s lifetimes. Audubon North Carolina staff will share the Audubon Ambassador program with us from 10 a.m. to 3 p.m. Monday, Nov. 16, at the KCEF Branch Library in Price Park. Although you will learn more about the science, the focus will be on what you can do to lessen climate change, and, most importantly, how you can share with others your concerns about climate and birds. Although the subject is serious, the session is fun. You will leave with new friends, new skills, and new hope. Everyone interested in volunteering a few hours a month as an Audubon Ambassador is welcome! You will leave empowered, supported, and hopeful in the face of the climate challenge. Lunch is provided for those who register. Please sign up by clicking here. On Saturday, Oct. 24, TGPAS had a wonderful outing with our friends in the Forsyth Audubon Society (FAS) to Tanglewood County Park in Clemmons. Ten TGPAS folks joined 20+ FAS members to see some of the great things that chapter has been doing to help make the park more bird friendly. 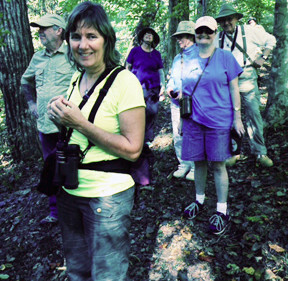 The highlight of the bird walk was our tour along the Yadkin River Nature Trail. The trail meanders through woodlands along the river and inland a short way to a large open meadow where FAS has encouraged park staff to plant native grasses and flowering plants. Purple Martin nest boxes and bat roosting boxes have been installed in the meadow. Along the way, we saw about a dozen very professionally produced signs with clear explanations and beautiful graphics describing the wildlife of the area. Many of the photos are the work of FAS members, particularly David Disher. We were very impressed. We got to see a good selection of bird species including a few winter species such as Hermit Thrush, Yellow-bellied Woodpecker, and White-throated Sparrow that have arrived in the Triad. This also turned out to be a good park to find Red-headed Woodpeckers. We even saw seven late season butterflies. We are grateful to FAS president Rob Rogers for his planning and leadership, Phil Dickinson for stepping forward to serve as co-leader when we decided to break our large crowd into two smaller groups, and immediate past president Carol Gearhart for taking our TGPAS group under her wing as we were touring the trail. You couldn't ask for more cordial hosts and a better field trip! 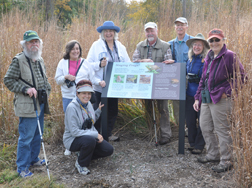 Pictured above, at one of the educational signs in the native grass meadow (left to right) are TGPAS members Gregg Morris, Marie Poteat, Sarah Gilley (kneeling), Lynn Burnette, Dennis Burnette, Jack Jezorek, Ann Walter-Fromson, and Ann Vansant. Not pictured are Stella Wear and Tom Wear, who also were part of our group of 10. The Audubon Wildlife Overlook burned to the ground in October. 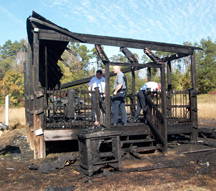 The Fire Marshall is still investigating, but it is clear to park staff who observed the fire and to those who looked at the debris that the fire was deliberately started. It is certainly a sad day for Pearson Audubon volunteers and those in the area who have enjoyed the Overlook at the park. The TGPAS board will be considering whether we should rebuild or not, but for now we can just move forward with our many other projects that make us happy and help our birds. When: Thursday, Nov. 12, 7 p.m.
Last May Heather Hahn, Executive Director of Audubon North Carolina, gave a program for Pearson Audubon that outlined some of the science of climate change and, in general, what sort of threats it will cause for North Americal birds. Curtis' presentation will bring us more specifics on what can be expected in the Piedmont region as climate change ramps up. He will talk about what birds and plants we may see in 30 to 60 years, and which we may never again see here as a warming climate forces them to seek different habitat. 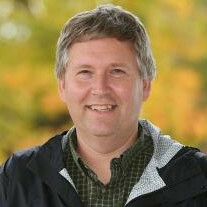 Curtis has been a regular speaker on the TGPAS program schedule, and we are so pleased that he is returning this year. All who have heard him give a presentation know that his talks are informative, entertaining and fun. Curtis is one of our favorites, and we are lucky to have him working for Audubon NC and for our birds.Curtis oversees Audubon North Carolina's Saving Important Bird Areas, Putting Working Lands to Work for Birds and People and Bird-Friendly Communities initiatives, and works on energy policy issues for the state's Shaping a Healthy Climate Initiative. He also engages dozens of conservation partners regionally, nationally and internationally to ensure North Carolina’s birds are protected throughout their entire annual life cycle. This program is the third of three this fall which the chapter chose to fit the nature and science theme of Greensboro's One City One Book three-month event. Please mark your calendar for this program, and plan to come fifteen or twenty minutes early to chat with Curtis and fellow nature lovers. Where: Hagan Stone Park and Company Mill Preserve. When: Sunday, November 8, 1:45 p.m. departing across from Whole Foods Market, Friendly Shopping Center, under the Sears Plaza sign facing Friendly Avenue, between BB&T and Chick-fil-A. Hagan Stone Park is well known to Audubon folks, but most probably do not know about the new Company Mill Preserve. One of Guilford County's 14 nature preserves acquired with the leadership of the Open Space Committee, Company Mill adjoins Hagan Stone. The two properties comprise about 600 acres of land in the southeastern part of the county. The park has extensive recreation facilities, but the preserve's main goal is to maintain the natural features of the forest and the extensive wetlands behind the old mill dam. Our walk will sample both the park and the preserve. We'll be loking for Sunday afternoon birds and maybe some early waterfowl on the park's ponds, as well as fall wildflowers and turning leaves. This outing promises to be an enjoyable fall “walk in the woods”, in keeping with the Greensboro One City One Book series of events. Please plan to join fellow Auduboners for our walk in the park---and the preserve. Bring the kids, bring the grandkids, bring your friends. As usual we will gather at the Whole Foods parking lot, next to the Sears Plaza sign near Friendly Avenue, between BB&T and Chick-fil-A. Please arrive at 1:45 for a 2 p.m. departure. We'll carpool to the site. The co-chairs met with Professor Somers last summer to suggest some field trips and other course activities as she was developing the fall semester course syllabus. By the time classes began, 17 students had enrolled. 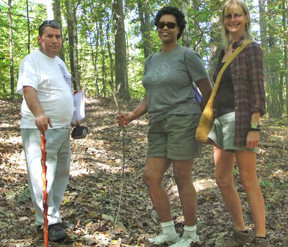 The Audubon co-chairs have led two nature field trips thus far, one in Peabody Park on the university campus and the second in the Greensboro Arboretum. The students were given an introduction to wildlife watching as they recorded in their journals the names of the birds, insects, flowering plants, and trees they encountered. They also received a “mini-lesson” on stream dynamics. The students have been involved in many other interesting learning activities. Several more are coming up toward the end of the semester for which TGPAS has offered assistance, including creating a new pollinator garden at UNCG in a plot in a parking lot beside the baseball field, enhancing the no-mow zone at Peabody Park with 110 pollinator plants, and working with the Kathleen Clay Edwards Family Branch Library in Price Park with habitat enhancement. All of the course students were added to the distribution list for the TGPAS newsletter, “Nature Notes,” and have been encouraged to participate in chapter activities this year. Wonderful weather and a great turnout made for an event to remember for our October 11 Second Sunday Nature Walk in Jamestown. With more than 50 people, we divided into four groups based upon interest of the groups. 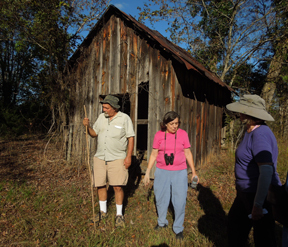 Each group took different directions but walked around most of the property and observed beaver activity along the river, many species of birds, several butterfly species, and all sorts of native plants. The acres of Piedmont prairie that have been planted with native warm season grasses and native forbs for pollinators and birds are always a favorite destination of the attendees. Special thanks to Lynn Moseley, Dennis Burnette, and Jack Jezorek for being trip leaders. 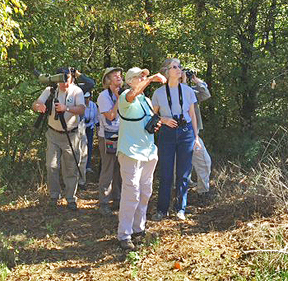 Lynn Moseley reported a total of 27 species and reported several special teaching opportunities to observe hard to identify birds in the field. The group that I led observed two pair of Red-headed Woodpeckers along the river in mature forest and a pair of Black Vultures sunning themselves in an open window of the old abandoned farm house where they nest every year. All the work on the property to establish native plants in various succession stages while controlling non-native species is certainly making a difference and appreciated by all. I certainly appreciated all the positive comments and interest in the habitat restoration projects. Photos provided by Judy Stierand, Tom Wear, and Marie Poteat. 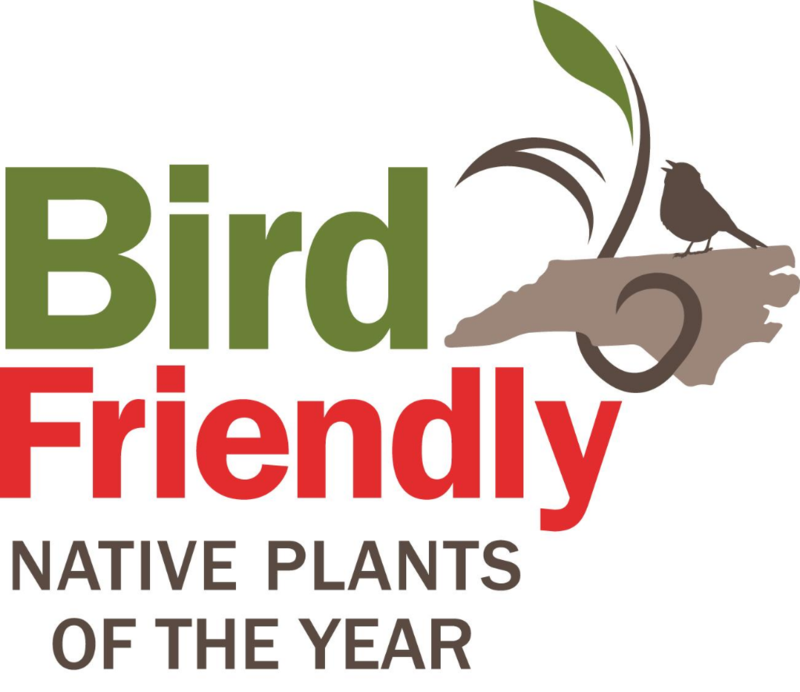 Here’s where you can buy bird-friendly native plants in the Triad area. 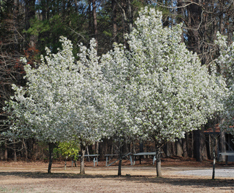 These nurseries are participants in Audubon NC’s Bird-Friendly Native Plants of the Year Program. TGPAS members Stella and Tom Wear enjoyed meeting with the Northeast McLeansville 4-H Club in September to deliver the message about Audubon North Carolina’s Brown-headed Nuthatch project. Under the leadership of Betty Engle, the club members have been studying wildlife conservation and were eager to help provide homes for Brown-headed Nuthatches. In addition to learning about the needs of nuthatches and how to monitor nest boxes, they were given one nuthatch house and 10 excluder plates. The box will be placed at Mt. Pleasant United Methodist Church where they have their regular monthly meetings, and the 10 plates will be used with boxes they buy or build. TGPAS member Lynn Moseley spoke to about 30 people in September at Friends Home West. Her presentation reviewed the remarkable adaptations of birds for incubating their eggs and providing parental care to their nestlings. Lynn gave examples of the great diversity of behaviors that have developed in different species in order to raise young successfully. She concluded by showcasing the Brown-headed Nuthatch as a species of concern in North Carolina, and the project of Audubon-NC to place 10,000 nest boxes for nuthatches across the state by the end of the year. TGPAS member Lynn Moseley spoke to 12 people in September at the KCEF Branch Library about the results of National Audubon Society’s major study on the effect of climate change on 588 species of North American birds. She also explained ways in which homeowners can help to minimize some of the negative effects of climate change on birds. The talk concluded with a brief overview of predictions about the impacts of climate change on the Appalachian Trail, with reference to Bill Bryson’s book. TGPAS co-chair Dennis Burnette, assisted by Deborah Staves, also an Audubon member and a Master Gardener, spoke in September to 27 Extension Master Gardeners at the NC Cooperative Extension - Guilford County Center, 3309 Burlington Road Greensboro. In addition to the talk, Dennis and Deborah provided a Brown-headed Nuthatch box and two native plants (Virginia Sweetspire) as door prizes. They also donated two additional plants for the Master Gardeners’ Demonstration Garden. 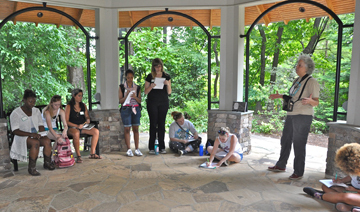 TGPAS co-chair Dennis Burnette gave a talk in September followed by a nature walk at the KCEF Branch Library. The city's selected book, "A Walk in the Woods" by Bill Bryson, served as inspiration for the presentation: “A Walk in the Neighborhood: Discovering nature in our parks, trails, and our own neighborhoods.” Dennis noted to the 10 participants that birds, butterflies, and botanical wonders abound around us, but sometimes we overlook them in our busy lives. Participants learned how to explore the natural world with a walk in the woods, along roadsides, and even in our back yards through discussion and beautiful photos.